Lauren Green of Fox News apologized to her guests for surprising them with a different topic. She wanted to talk about God in light of the tragedy that happened at Sandy Hook Elementary School where 20 children were brutally slaughtered. "IF there is a God, why does He allow this?" Her guests struggled with an answer. Green pressed on obviously seeking something concise, not happy with the response of how to comfort victims. "What kind of evil is out there that would choose such an innocent group of human beings? If children aren't the most innocent, I don't know who is. What kind of evil does this?" Yesterday's tragedy is ripping the hearts of so many. Any parent that has held the hand of their kindergartner on their first day of school is breaking at the thought of the horror that happened. Prayers are flooding our nation as many also ask, "Why, God, WHY?" Christians will answer that God doesn't do it, man does. But are they implying that God is sleeping? That He didn't notice what was happening? We worship a loving God, where was He? The answer will be hard for many but try to see it from God's point of view. Green wants to know what evil does this and someone needs to point out that it BEGINS in our public schools. We have a generation of kids that are being taught that there is no God. Under the guise of "multiculturalism," they are given shallow samples of religions and are told they are all equal (with the exception of Islam), which leads anyone to the obvious conclusion that all beliefs can't be right so all must be wrong. THIS is spiritual harlotry and it is the GOAL of our public education that our children sample all of them to see them all as useless and the cause of war. Attempting to fill in the gaps, "how life began" is offered by pseudoscience simply making up that man evolved from species jumping from kind to kind without a SINGLE shred of proof. These heinous killings in the news are the result of atheism promoted in public schools. Our kids are without a moral compass. We tell our children that they came from apes and then wonder why they act like apes. We are creating the Adam Lanzas, James Eagan Holmes's and Jared Loughlins, then rail at God for allowing them to kill. Not only that, but these little ones that were taken from us are gifts from God, and we are teaching them that GOD doesn't exist? What kind of evil does this? It is us! Yes, there are some good teachers but the direction of the academic elite, teacher's unions and state standards have clearly lost their way. These precious little children have begun their lessons to reject God, which God allows because He gives us free choice. But I have to wonder why we expect God to then stop the murderer from carrying out his evil, so that His kids could grow up and do the same? Understand, God welcomes children into heaven. After King David's child died, David said he would see his child again. (2 Samuel 12:22) These lives that were cut short did not cease to exist, they are with God. He didn't do it but they ARE SAFE. What is at stake here is far more than our children's lives, though that is hard for us to imagine. It's their eternal destination. Eternity is so much more than this fast little life that we all go through. I am acutely aware of why God might allow a child to die at a young age because I have been asking the opposite, why did He allow my sons and me to live? God supernaturally saved us years ago. I was grateful but one of them has grown up and now claims to be an atheist. I have asked, "Lord, why did you let us LIVE?" I would have far rather my sons and I died that day and were secure in heaven, than risk one of my own rejecting God and suffering the eternal consequences of life and death without Him. (And NO I would never consider doing such a thing, which goes against everything God has said! Don't even start with that ridiculous accusation.) I thought I could prepare my sons to not believe everything they were taught in public school, but five days a week, seven hours a day of being taught by professionals trained to convince our children that parents don't know anything has taken its toll. They call it, "critical thinking" but our kids are not taught to criticize anything that the teachers teach. They are only humiliated if they express any real faith in God. To be spared supernaturally for this end makes no sense to me. All of these people asking why did God let their children die and I want to know why God let us live. And yet God gives me peace when I pray about it, God is not finished with my son. There ARE reasons from God's perspective to welcome a child home. 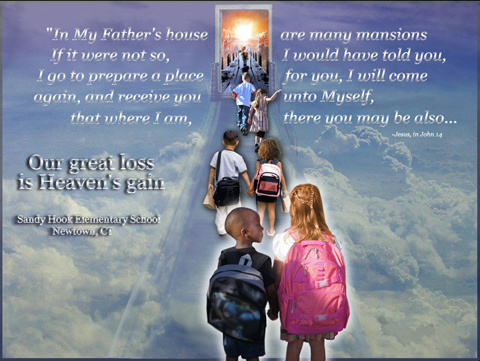 Our loss is heaven's gain, but if we are His we will see them again. It is hard, but know that nobody loves our children as much as God does. Trust Him. Two days ago, I was happily walking in the rain. I stretched out my hand from under my umbrella hoping to feel the spray of it. A single large drop splashed on my finger and I froze with the knowledge that something terrible was going to happen, it was like a teardrop from heaven and I remembered how Christ wept for His people. I have felt sick to my stomach ever since. God is GRIEVED about the sorrow that is going on, He knows every tear, every heart wrench of the families. No, this was not God's plan for those precious children's lives, but He does turn what was meant for evil to good, He does welcome us home, as many as will come. What happened yesterday, the sorrow that these parents must be going through, I cannot begin to comprehend the depth of it. I know many are angry at God, but how confused we are to blame Him. I know we want those children with us, but our society has given our kids over to darkness as we teach them to bow to Allah in demonstration, lead them to believe there is no God, hand them condoms and tell them to experiment with both boys and girls in the most profane of ways and if they wind up pregnant, can be driven to butcher their own babies off campus while mom can't ask teachers to give her children an aspirin without 15 forms signed by a doctor. What kind of evil does this? It is a principality that is in our public schools. And then we blame God when our children suffer. God did not kill them but He did welcome them home. The suffering is not in heaven, it is here. Please pray God comfort the families in this tragic time of loss.